In this post, we offer a GENERAL explanation of the differences between digital and offset printing based on a specific job. We realize we haven't covered every detail, but we figured photos would be helpful if you're a newbie. Every printer we've worked with has different methods, machinery, and capabilities, so be sure to discuss your options with your print shop or designer when the time comes. A few weeks ago, we shared this Save the Date we designed for our friends. Since I had a digital and offset sample of the same thing, I took a few photos of them side-by-side so I could share with you some important information about printing. Digital :: Think of this printer as a commercial version of the printer you have at home. It uses 4 inks (or toner) to produce full color images. Different percentages of Cyan, Magenta, Yellow, and Black ink combine to create every color you'd need to print. This is also referred to as CMYK or 4-color-process. Kinko's and office supply store chains like Staples use digital printers. The upside of them is that you can get color printing either on the spot or within a few hours. The downside of them is that 1) you usually can't print with bleed (i.e., your designs need at least a 1/4" border around them), and 2) you have few options when it comes to paper. Local and online printers that offer digital can print with bleed, but you may pay a rush fee if you need something within a day. Also, the number of paper options increase with a local printer because they'll use whatever you ask them to (assuming it's suited for digital printing). Technically, these are the same color name in a swatch book. However, the digital sample on the left has been printed with C, M, Y, and K, and the offset sample on the right has been printed in a Pantone. See how much brighter and richer the color is on the right? 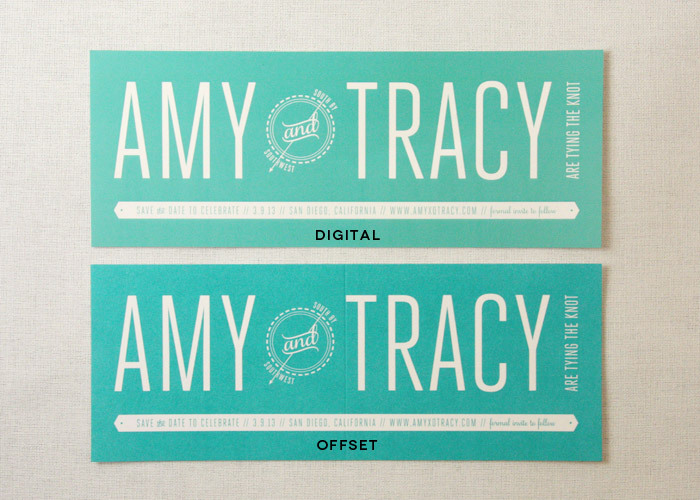 If you print offset, you'll have the option of using Pantone colors like this. If you plan on printing digitally, here's our simple advice :: keep color in mind. Choose colors based on CMYK swatches so you have a more accurate idea of what the results will look like. 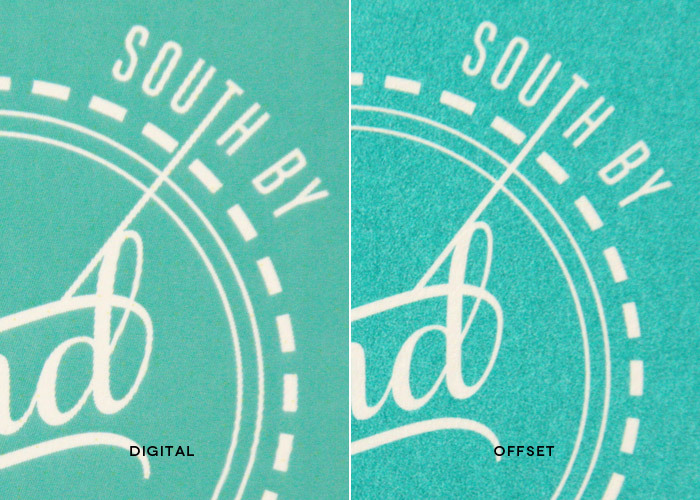 Remember that no one will see the "offset counterpart" to your printed piece, so don't stress! *Most online printers will not offer offset for quantities below 250 or 500, but, if you're lucky, you'll find a local printer willing to do it for a decent price. **One way to achieve smoother lines with digital printing is to use solid (100%) C, M, Y, or K. Be careful with light tints and opacities, as those tend to accentuate the dots. See how the letters look like they're made of tiny blocks in the digital sample, and how much smoother the lines are in the offset sample? Of course, most people would not scrutinize paper like this. Only designers, printers, and people with OCD would. Go back to the top and you'll see it's not as noticeable when you're not zoomed in at 500%. Need more help deciding? See our handy quick reference guide below!